Karaoke music CDGdiscs Chartbuster Kareoke CDG discs CD+G country bluegrass. Buy Karaoke Music and karaoke songs at great discounts. Some people spell it like this; kareoke music but we believe karaoke is correct. Chartbuster 90 s Country CD+G 6-disc collection of the hottest hits from the hottest hitmakers such as Alabama, Clint Black, Patty Loveless, and more. 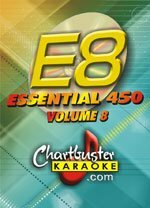 Chartbuster 50 Song Pack: Greatest Songs of Classic Country Volume 2 CD+G A great countrified karaoke collection! Dust off your cowboy duds and get ready to sing the greatest hits of Hank Snow, Marty Robbins, Johnny Cash, and more. CD+G format. Chartbuster 50 Song Pack: Greatest Songs of the '80s Country Volume 2 CD+G Certified hits for you country crooners. Load up your karaoke player with this lively collection of the finest '80s vintage country. Features "Long Haired Country Boy", "Forty Hour Week," "Always on my Mind," and much more. CD+G format. Chartbuster 50 Song Pack: Greatest Songs of 70s Country Volume 2 CD+G Break out the mic and get ready for non-stop hits! 3 more discs of country winners from stars including Dolly Parton, Kenny Rodgers, Mel Tilliis, and many others. CD+G format. Chartbuster 50 Song Pack: Greatest Songs of 90s Country Volume 2 CD+G Get ready to 2-step! Another collection of the biggest country smash hits. Includes "I'm That Kind of Girl" by Patty Loveless, "Dumas Walker" by the Kentucky Headhunters, "Lord have Mercy on the Working Man," by Travis Tritt, and more. CD+G format. Chartbuster 50 Song Pack Greatest Songs of Country Divas All the queens of country in one collection! From Shania Twain to Faith Hill and the Dixie Chicks, this one has all the best from the goddesses of country. CD+G. Chartbuster Classic Country Volume 1 CD+G All the good old tunes. 100 songs in CD+G format. It's a great selection of country classics, essential for any karaoke library. Chartbuster 50 Song Pack: Greatest Songs of Classic Country Volume 1 CD+G A cavalcade of country gold! Check out this archive of the best from your country favorites including Hank Williams, Lefty Frizzel, Patsy Cline, and more. CD+G format. Chartbuster 50 Song Pack: Greatest Songs of '80s Country Volume 1 CD+G Transport yourself back to the heights of eighties country! Revisit chart-toppers from Charlie Daniels, Conway Twitty, Hank Williams Jr., Dottie West, and many others. CD+G format. Chartbuster 90s Country Volume 2 CD+G An indispensible collection for country fans! This 6-disc collection includes all the biggest hits from the brightest stars in country including Brooks & Dunn, Alan Jackson, and Tim McGraw. Chartbuster 50 Song Pack: Greatest Songs of 70s Country Volume 1 CD+G 3 discs of country fun from an all-star crew including hits from Merle Haggard, Charlie Pride, Loretta Lynn, and more. CD+G format. Chartbuster 50 Song Pack: Greatest Songs of '90s Country Volume 1 CD+G 100% country, 100% hits! Climb the country charts with another super Chartbuster collection. Features Garth Brooks, George Strait, Reba McEntire, and many more greats. CD+G format.